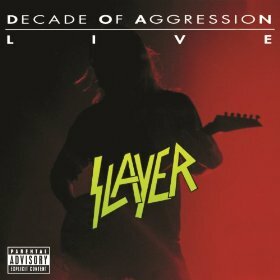 Decade Of Aggression is a live album by American heavy metal group Slayer. This isn’t to my tastes but it is doing well in my readers poll to find the best heavy metal live album. It’s an album that makes me feel very old. Is this the best of the live albums by Slayer? Why is it so good? To help to find the best live albums I have created the best heavy metal live album poll. This entry was posted in 1990s Live Albums, Heavy Metal Live Albums and tagged 1990s hard rock, 1991 live albums, heavy metal 1991, Slayer Live Albums by Paul Simister. Bookmark the permalink.